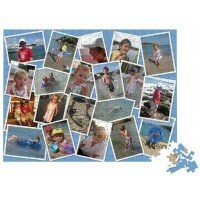 A quality 1000 piece personalised collage photo jigsaw puzzle made into a scattered photo style montage from a collection of up to 20 of your own favourite photos. 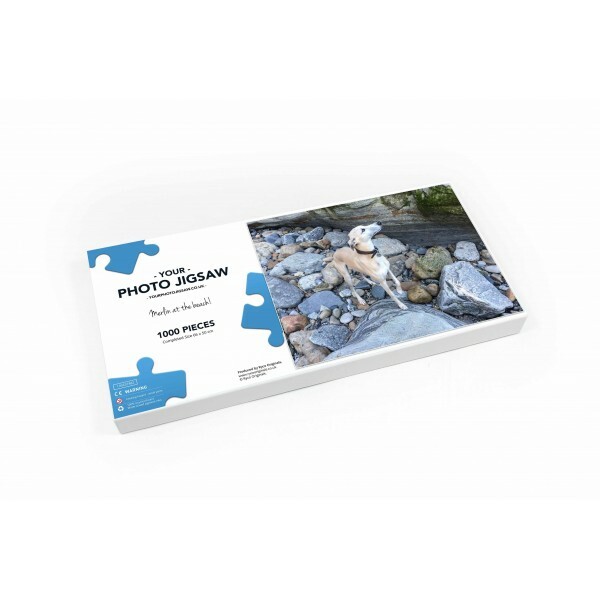 A personalised photo collage jigsaw puzzle is a collection of your photos designed into a single image and then made into a quality personalised photo jigsaw puzzle. It is especially suitable if the image you wish to use is below our recommended quality such as those taken by mobile phones. Simply e-mail up to 20 of your digital photographs and we will create a scattered photo style collage of your images and send this back to you for approval. Once approved we will manufacture a quality 1000 piece boxed jigsaw puzzle. The box lid will also have a copy of the collage along with your chosen message. Please enter your message, up to 60 characters over 2 lines, in the boxes in the product customisation section below before checking out. This collage jigsaw is uniquely personalised to you and makes a great gift to celebrate Christmas or a special occassion such as a holiday, wedding, anniversary, birthday or for that someone who has everything! 1,000 pieces - size 66 x 50 cm (26 x 20 ins). We recommend that you send no more than 5 image per email.